New Delhi, March 17 (IANS) Punjabs newly-appointed Chief Minister, Amarinder Singh told Congress Vice-president Rahul Gandhi in 2015 that he was ready to quit and float his own outfit, if he was not appointed state party chief. An authorised biography of Amarinder Singh claims that even though Sonia Gandhi was open to bringing Singh back at the helm in Punjab, Rahul Gandhi was dead against taking away the baton from Pratap Singh Bajwa. 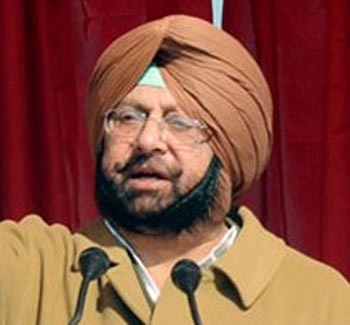 Tensions reached a high point in October 2015 in the capital when Rahul Gandhi asked Amarinder Singh if he was floating his own party to which Singh replied: "What you've heard is absolutely correct," biographer Khushwant Singh, not to be confused with the late literary giant, quotes him as saying in "Captain Amarinder Singh: The People's Maharaja". "If I do not fit in your scheme of things, I will need to find an alternative. I live in Punjab; the Akalis have ruined Punjab and I have to look for my own path if you don't have a plan for me," the biography quotes Amarinder Singh as telling Rahul Gandhi. Rahul Gandhi, on his part, said that if this step was taken both the Congress and Amarinder Singh would be the losers. "So be it," contended Singh. Eventually, Amarinder Singh was appointed as the Punjab Pradesh Congress President on November 27, 2015. He was sworn in as the Chief Minister on Thursday after the Congress romped home with 77 seats in the 117-member assembly. Bajwa represented Gurdaspur in the Lok Sabha from 2009 to 2014. He was earlier a member of the Punjab assembly and was elevated to state party chief in March 2013. Even after Amarinder Singh's victory in the 2014 Lok Sabha election from Amritsar - where is resoundingly defeated Arun Jaitley despite the Narendra Modi wave of that year -- his focus was totally on regaining his lost berth as the Punjab Congress chief, which would eventually help to again catapult him into the Chief Minister's chair. But the Congress high command turned a deaf ear to his claims, pushing the Punjab unit of the party towards factionalism as Singh and Bajwa began flaying each other in the media. "Amarinder Singh, who had enjoyed a very cordial relationship with Sonia Gandhi, suddenly felt cold-shouldered by the Gandhi family. Rahul Gandhi, whom Amrinder Singh would frequently take out for outings whenever he visited Doon School to meet his son Raninder, was adamant that he would not consider the case of his father's friend," Khushwant Singh writes. Published in the last week of February by Hay House India, it is the authorised biography of the Punjab Chief Minister and, therefore, clearly implies that Amarinder Singh has duly approved all the incidents and facts that find mention. By the end of 2014, several meetings between Amarinder Singh and the Congress top brass yielded no result. During this period of uncertainty, his team also flirted the idea of him becoming part of the Bharatiya Janata Party (BJP) and when this too did not work, he flexed his muscles further. Singh then went on to question the leadership ability of Rahul Gandhi time and again but the Congress high command "seemed to be shutting its eyes, the ground reality notwithstanding". After his pride had been hurt, he was advised by his supporters to float his own party, but Singh held Sonia Gandhi in high esteem. "The reverence is not just an outcome of she being an ex-Prime Minister's wife or his schoolmate's wife but more so for her ability to lead the party. Referring to her as ‘Mrs Gandhi', he frequently expresses gratitude to her for allowing him to lead the Congress in Punjab for so many years as well as for making him the Chief Minister (in February 2002)," states the biography, based on scores of interviews spanning over five years. The situation, according to the biography, deteriorated further in one closed-door meeting at 10, Janpath, in late September 2015 when "the Congress Vice-president did not bestow the respect a senior leader like Amarinder Singh deserved". Rahul Gandhi was reminded by Sonia Gandhi that he was talking to his father's friend, after which he calmed down. Besides tracing the career graph of Amarinder Singh, the book provides meaningful insights into crucial events that have made an immense impact on that state and its neighbouring areas over the past few decades. Often confused with late writer Khushwant Singh, who wrote the much-acclaimed 1956 historical novel "Train to Pakistan", biographer Khushwant Singh is the author of three books: the best-selling "Sikhs Unlimited" (2007), a travelogue featuring extraordinary Sikhs; the gripping "Turbaned Tornado: The Oldest Marathon Runner Fauja Singh" (2011); and the widely-acclaimed novel "Maharaja in Denims" (2014), a story set in Chandigarh.